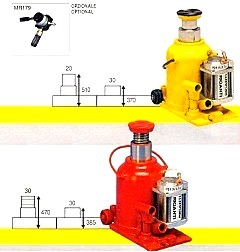 Hydraulic bottle jacks for the manual vertical lifting of motor vehicles, especially industrial vehicles. Hydraulic jacks with trolley for the manual vertical lifting of motor vehicles and industrial vehicles. Pneumohydraulic jacks for lifting vehicles and industrial vehicles. Demountable and folding cranes with single or double acting pump. The hydraulic jack and pit jacks for the manual vertical lifting of gearboxes, differentials, clutch groups, suspensions and engines of both cars and lorries, during the dismantling and assembly phases of the same in the pit and underpass. Hydraulic presses for straightening, bending and drawing, for assembly / disassembly of forced couplings, for assembly / dismantling of engine parts, gearboxes, etc. Presses crushes filters for the longitudinal compaction of oil and diesel filters of cars and trucks (both light and heavy) and the consequent separation of the polluting liquids contained in them. Hydraulic jacks from pit and MR 2000 model sub-bases for the partial lifting of trucks and for the lifting of gearboxes, differentials, clutch groups, suspensions and truck engines, during the dismantling and assembly phases of the same in the pit and underpasses.